being MVP: Tiny Tillia by Avon & Giveaway! Tiny Tillia by Avon & Giveaway! When I was growing up I remember my mother perusing the Avon catalog and ordering massive amounts of product. I actually used the Skin So Soft line :) Now a mother myself, I was excited to learn that Avon has come out with the Tiny Tillia line which is chock full of baby and toddler clothing, toys, decor, bath/body products and much more. Kenzie received the Ben Giraffe raincoat and matching Star Rain Boot. She was hesitant at first to try the boots because they were a bit large (even though we received a size 7, it seems to run big). However, one day she just put them on herself and started jumping around. Since that day, Kenzie puts on her rain boots everyday and jumps around the house. It hasn't rained yet so we haven't gone outside with them. The boots up about mid-calf and there is a soft jersey lining to keep feet comfortable. The star design pops against the orange boots and who doesn't love the orange/blue combo (go Gators!)? The Giraffe raincoat is equally adorable with the pop of orange: buttons and hood lining against the blue coat. The coat is made of a water-resistant microfiber and features a reflective tape for visibility - perfect for keeping little ones safe while out playing in the rain. I like that this raincoat is machine washable so when Kenzie does actually get into the rain and gets dirty, I can just toss it into the washing machine to make it new again. 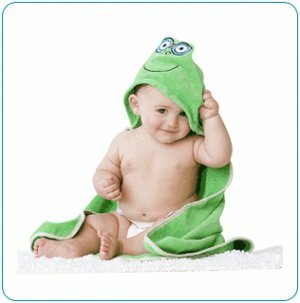 Bean received the Trace Frog Hooded Bath Towel. It is made from 100% cotton terry and is pretty large in size (29" x 29"). Kenzie can actually use it as her towel until bean arrives. The towel is fluffy and the hood is great for keeping bean's head warm after a bath. Buy It: You can purchase the Ben Giraffe raincoat for $30, Star Rain Boot for $25 and Trace Frog Hooded Bath Towel for $16. Make sure to connect with Avon on Facebook and Twitter! One Winner will Receive the Tiny Tillia 3-Piece Gift Set! I like the Summer Romper. I love the Sundress with Bloomers! So cute! Those boots are adorable. I like the PLaysuit zipper top + pants. I also love the Tiny Tillia World Playmat! I love the pink and blue car seat covers! I love the Seat Belt Pillow! Love the Tiny tilla ark playtime toy! so cute! I love the Flowers in Bloom Dress for Baby Girl. I like the Flowers in Bloom Dress. So pretty and colorful! I love the world playmat! I love the Tiny Tillia Green 5-Piece Layette Set! I like the green kimono top playset. I'd love to try the Calming Lavender Shampoo. I like the nesting blocks. I would also like to have "My First Backpack - Duncan Dog"
I love the Growing Bodysuits! It is my new go-to baby shower gift. I like My First Backpack, Duncan Dog. So cute! Sundress with bloomers is cute. I would also love the Playsuit Ruffle Top + Legging! The Mommy Tillia Shea Body Butter looks very nice!